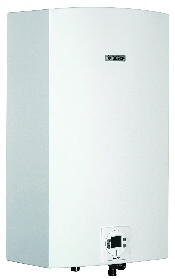 The NEW Bosch AquaStar 2700ES NG (Natural Gas) Tankless Water Heater is built to supply 2-3 major applications at a time! With a maximum BTU input of 199,000 BTU/hr, this heater is Bosch's most powerful offering. In warmer climates, you may be able to run 3 simultaneous showers! The Bosch 2700ES is Energy Star rated and qualifies for the 2009 - 2010 Federal Tax Credit of up to 30% back on the price of the heater and its installation! The Bosch AquaStar 2700ES is a sealed combustion tankless water heater, which means that you can pull combustion air from outside (recommended) or potentially from the inside (depending on your available air volume). The exhaust venting can run either to an outside wall or up through the roof. The AQ3ES vent kit is required for venting out the side wall. You may use PVC or rigid sealed 3� or 4" pipe. Please read the Installation Manual for the full details. The Bosch 2700ES NG can easily be converted to an outdoor heater for qualifying locations by adding the optional AQOK Outdoor Kit. Our most powerful offering, its compact size and sealed combustion enables installation in small spaces. This unit also features an adjustable temperature control for improved comfort. With an average life expectancy of more than 20 years, energy savings of up to 50%, and an endless supply of hot water, your family will thank you for years to come. Easy to install with multiple venting options, the Bosch AquaStar 2700ES-NG whole house tankless water heater is the right choice.